TRIMS Inventory System tracks spares parts, supplies, and fuel as they are purchased and consumed. Items are entered into Inventory by Purchase Orders and removed through Work Orders or Fuel Pump Ticket Recording. Purchase Orders are used to update inventory, record expenditures and track vendor activity. Purchase Orders can also be used to record non-inventory purchases such as contract labor and consulting services. Order status showing items ordered, received and back ordered is instantly available. When on-hand quantities fall below preset levels, TRIMS has a special alert feature which highlights those items needing to be purchased. You can easily create a new Purchase Order and fax or email it directly from your TRIMS System. 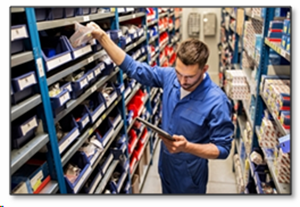 Need to find out which Vendor you last purchased a spare part from? TRIMS Vendor File is integrated with both Inventory and Purchase Orders allowing ALL Vendor Activity and Latest Costs to be tracked with no additional data entry. Complete fuel pump and storage tank records are maintained, accounting for every gallon purchased or pumped. Pump and Tank Reports show each fuel transaction and call attention to discrepancies caused by fuel vendor billing errors, recording errors, theft, and possible storage tank leakage.